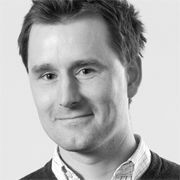 Simon is currently working as a Creative Partner for the advertising agency DDB Stockholm. He has just returned to DDB Stockholm from a two-year stint at the sister agency DDB Copenhagen, after leading that office to their best ever result at Cannes Lions and a Grand Prix at the Advertising Effectiveness Awards. Prior to DDB Stockholm & Copenhagen, he has had stints in both the UK and Australia, working on great brands like Volkswagen, McDonalds, MTV & Unicef to name a few. Prior to Stockholm, Simon worked as a creative in both the UK and Australia with McCann Erickson and The Works Sydney, working on great brands like Volkswagen, McDonalds, MTV and Durex. Simon's awards haul includes a Titanium lion, a Cannes Cyber Lions Grand prix, 9 other cannes lions, the Eurobest Outdoor Grand Prix 2010, the Eurobest Outdoor Grand Prix 2011, 14 other Eurobest statues, multiple one show pencils, two Gold and 4 silver eggs at Guldägget (swedish awards), DDB’s highest accolade The Bill Bernbach award, the grand trophy, green trophy and platinum trophy at the international effectiveness awards plus awards at every other major show. He was also recently picked out by creativity magazine as being a creative to watch. Simon chose the Berlin School of Creative Leadership to work with and learn from a global creative community. “I realize that to work on the global stage I must understand how every culture works and be able to adapt and use differing methods in differing situations,” he said. “I plan to leave Berlin with a better understanding of how exactly to do this. ".